← Call for Advice: To WP.org or Not to WP.org? The story of my morning has three characters: a spider, the Quick Chek Man, and me. For the past week, a brown and black spotted spider, about the side of a nickel, has taken residence in our driver side mirror. When he isn’t building his web, he crawls inside the casing, angrily taking shelter from the wind of the car’s motion. He first appeared last Tuesday when Ben and I came back up from vacation. We came back up midweek to work a few days, and then returned on Wednesday. When I left my house for work Tuesday morning, I opened the car door and felt familiar, “Oh crap there’s a spider web attached to me,” feeling and quickly smacked around my head to make sure its owner was not attached. This time, it was. Swinging toward me like an panic-stricken trapeze artist, the equally frightened spider came barreling toward me. He was attached to my dress. I did the only logical thing and screamed like a small child, to which my brave heroic husband came to the rescue and brushed him away. The spider swung up to the car and begrudgingly took to his hiding spot. It wasn’t until I got into the car that I saw the beautiful web attached to the car I had almost completely destroyed. I didn’t have much of a choice, I had to drive my car, but I still felt bad. To both our surprise, there he was the next morning, beautiful web right back where it was. Well now I just felt like a jerk. 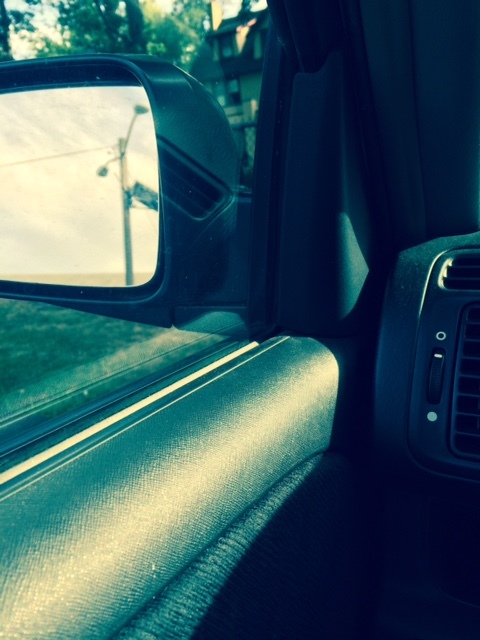 The spider saw me, retreated into his mirror, and I started the car. The web was gone by the time I got to school. Even after leaving for Cape May for four days and then returning, he is still at it, claiming our car for his home every morning. I tried to snap a photo of him this morning, but only got his house. As much as I don’t like spiders, I have respect for this little guy’s perseverance. For the past two days, I have stood behind an older man in yellow at the Quick Chek by my school. After noticing him the first time, I’ve started to see him every time I drive down the main road leading to the store. Each morning on my way to work, and each afternoon on my way home, I see him, walking back and forth to Quick Chek. He walks with the gait of a determined sleepwalker, and though his presence is intimidating, he has a kind face and is always polite to the cashier. I worry about him in the heat. In my family, we would say he’s “one of my dad’s.” My father has worked with mentally disabled adults since we were kids and since using the phrase “mental disability” was hard for younger kids (and because the word “retarded” was NEVER accepted in my house, even before people realized it was a hurtful term), we always said “one of my dad’s.” I’m not sure of Quik Check man’s situation, but I do see him three times a day, making his journey back and forth, even in the recent weather. I spent the morning feeling sorry for myself. Sometimes I feel like it’s just when we think we have our feet on the ground, something slips through the cracks, and yet again, we’re scrambling. Nothing major happened, and yes, we will be fine. But because of what has to be a bank error, we woke up to an all too familiar frustration. It’s hard to not feel like you’re starting from square one sometimes. Like the days are going around and around and each day someone is ripping down the web you spent all yesterday building. I dropped Ben off at the train and drove off feeling bad about our financial goof, bad about screwing over the spider, and just bad about anything I could find the excuse to feel bad about. And then I saw Quik Check man. He was on his morning trip, making his familiar journey to a place I’m assuming brings him comfort. I started to feel bad for feeling bad, but because of my experience with this cyclical frustration in the past, I caught myself. The spider, Quik Check man, AND I, have places to go and things that are important to us. It’s frustrating to feel like you’re only going in circles, hoping that things change. That throughout the day, you’ll get some magical email that says everything will be a little easier now. But the important thing is that the three of us are all still showing up. We got out bed and we are doing our thing. We are trying. Why does the constant rebuilding or the continuous journey back and fourth need to feel like a failure? And if this frustrating morning helped me connect to a spider and a stranger, then I am thankful for that. This entry was posted in Life and tagged Advice, Ambition, Goals, Happiness, Hope, Inspiration, life, Money, Motivation, Optimism, Perseverance, thoughts, writing. Bookmark the permalink. I like Quick Chek Man! And, begrudgingly, the spider.